It’s going to be 80 in southern Minnesota today. The leaves are still firmly attached to the trees and stubbornly green. But in a few weeks all of that is going to change and I’m going to be ready. Over Labor Day weekend, I finally finished weaving in the ends on my Plum Island Pullover. 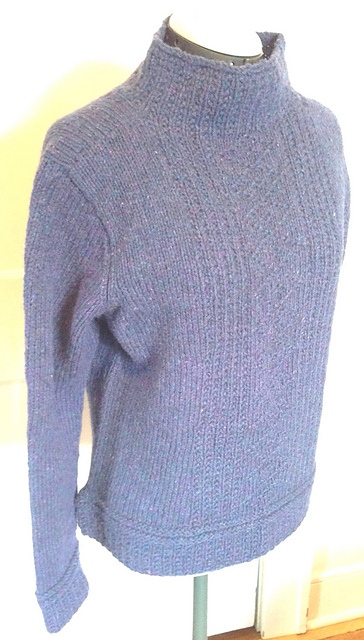 It’s a simple, gansey style sweater, with a slouchy, comfortable shape. The pattern is by Alison Green. The decided to knit this sweater during one of those rare moments of yarn-related serendipity. I had a pattern I wanted to knit and exactly the right yarn in my stash, the right yardage and everything. How often does that happen? I used Imperial Yarns Columbia in the Indigo Heather colorway. Hope the cold weather doesn’t hit too soon. Lovely sweater! We are in Milwaukee, and I am praying for those cooler temperatures this week. Just not the drastic ones. Probably mid 60s would be sweet. Awesome! I love when the stash stars align! Very cozy looking and so pretty! Aw thanks. I’m banking on the cozy thing so I can keep the heat lower this winter. I shall 🙂 I don’t own anything else like this. A new kind of sweater in my wardrobe. What a great, standard gansey with some visual interest in front. That’s what I thought. It was a soothing knit. Just enough pattern to keep me interested. I’m trying not to use this to justify the size of my stash. I’m supposed to be reducing it not finding excuses to build it up. You’re not sure you’re going to get cold weather where you live? We can’t even be sure we’ll have a summer in the UK! It is a rare, beautiful thing when you can get the perfect sweater out of stash. Congrats! Wonderful sweater. And you were successful in putting pattern to yarn and yarn to pattern.